Swedish shipping company Furetank Rederi AB has signed a contract for one 17,999 dwt dual-fuel product tanker at Avic Dingheng Shipbuilding. The agreement with the yard includes an option for one further vessel. 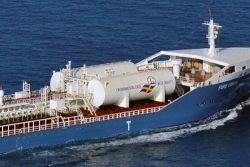 It will also sell the Fure Vinga, its 17,999 dual-fuel product tanker which entered into service in 2018, to Canadian buyers. The new vessel will be identical with the series of six sister vessels built by Avic Dingheng Shipbuilding for the Gothia Alliance members Furetank Rederi AB, Rederi AB Älvtank and Erik Thun AB during 2018‐2019. All vessels are designed with special focus on minimal impact on the environment and have dual-fuel capability, run on Liquefied Natural Gas (LNG) and several features that reduce fuel and energy consumption resulting in extensively lower emissions of CO2, sulphur oxide, nitrogen oxide and particulate matter. The 149 m (LOA) Ice class 1A vessel with a cargo capacity of 20,306 cubic meters is scheduled to be delivered from the shipyard in the fourth quarter of 2020. Furetank Rederi AB has also signed an agreement to sell the Fure Vinga to Canadian buyers. The vessel will be delivered to her new owners during April 2019. The Gothia Tanker Alliance is a market platform for small and intermediate product tankers, operating 40 vessels in European waters.